You know the stats. 70 percent of online shopping carts are abandoned before purchase, and by using an eCommerce email marketing tool like Jilt, you can recover some of that revenue. But here’s the rub: only a portion of those abandoned carts are recoverable. If you haven’t collected an email address from the customer, Jilt can’t send recovery emails. That’s why we’ve introduced a new feature that helps you collect email addresses from more of your customers, earlier in the shopping experience. If a customer has an account on your site and is logged in, Jilt already knows who they are, so it has the information it needs to recover abandoned carts. For customers who aren’t logged in, however, identifying them can be much trickier. One way Jilt figures out where to send recovery emails for non-logged in customers is by tracking shopping cart behavior and logging the customer’s email address as soon is it entered on the checkout page. That works well for many customers, but some don’t ever get to your checkout page or fill it out. 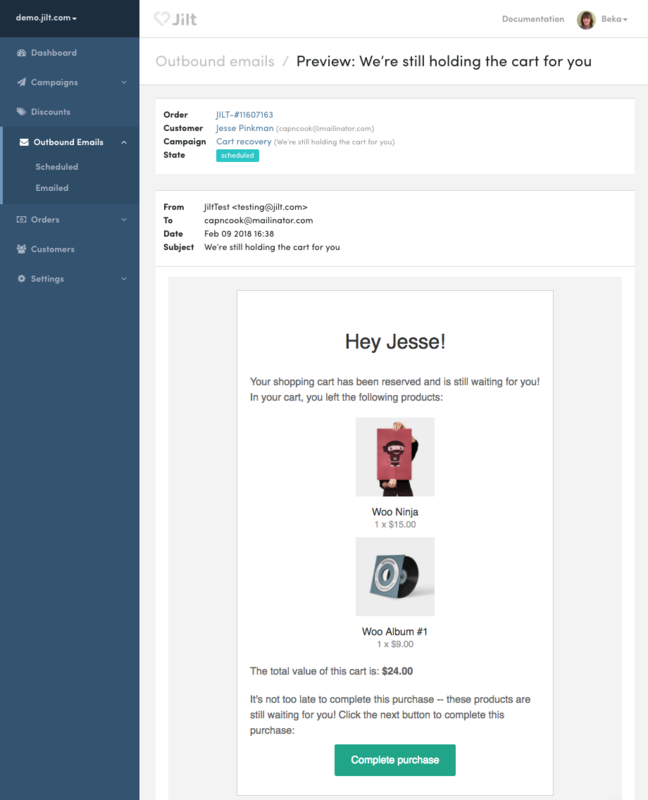 This feature is coming soon to Jilt for EDD in v1.3, and to Shopify stores later this quarter. Connecting plugins in WooCommerce can often be an arduous task involving secret keys, multiple steps, and tabbing back and forth between pages on separate sites. Who has time for that? We don’t. 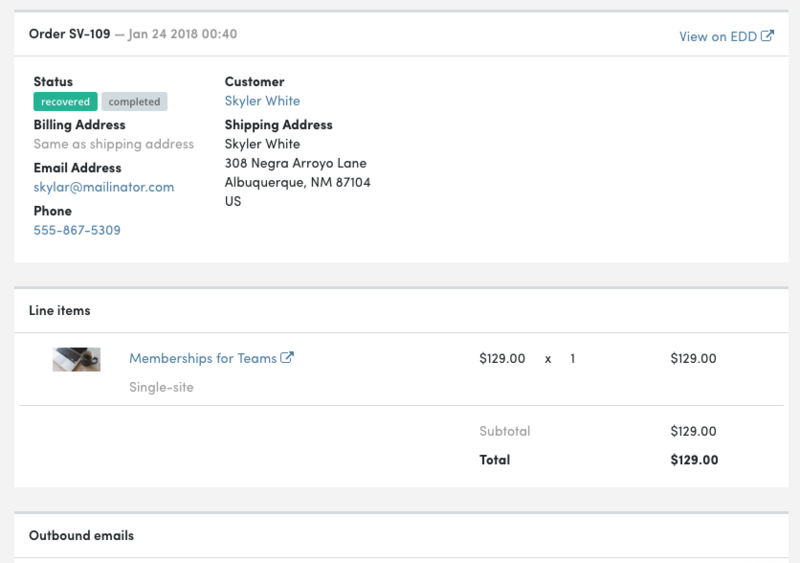 That’s why Jilt for WooCommerce v1.4 now includes a vastly simplified signup process. By using OAuth to authenticate your shop, you can now connect a WooCommerce store to Jilt with only a few clicks. That’s right: no more copy and pasting API keys! Just click, link your shop, and you’re done. EDD users, never fear, this simple authentication method is coming very soon in v1.3. What’s worse than not sending your customers any emails? Sending them bad emails. We’ve made it easier to make sure you don’t send emails with wrong information, copy mistakes, broken links, or any other faux pas by adding a “preview” action to all scheduled (unsent) emails in the “Outbound Emails” list. This lets you see exactly what a customer will see when receiving the email. 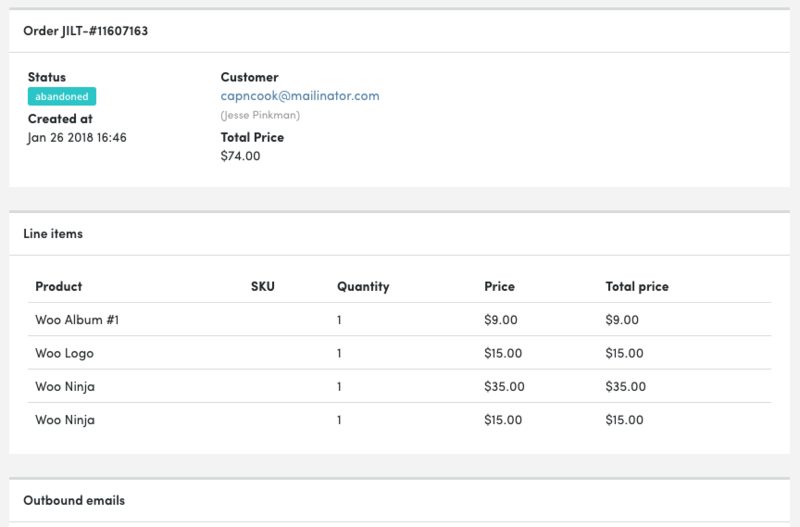 The preview shows you what the email will actually look like to the customer, by replacing dummy content with live content from the abandoned cart (e.g., customer’s actual name, cart items, etc.). This is also helpful for testing liquid changes to conditionally add content. 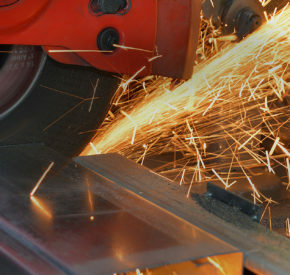 We’ve made a number of performance upgrades to the way the Jilt API processes incoming data from connected shops. This has led to massive speed improvements for stores, especially at peak times, and our API responses are now averaging under 100 milliseconds. This puts Jilt on par with top tier providers like Stripe, Shopify, Help Scout, and others. These API changes are already in place for Shopify and WooCommerce stores (using Jilt for WC v1.4), and Easy Digital Download stores will be able to take advantage of these enhancements with Jilt for EDD v1.3 soon. Earlier this month we announced a partnership with Liquid Web, one of our favorite hosting companies, to bring Jilt to all their WooCommerce managed hosting customers. We’re super excited about teaming up with Liquid Web to help even more eCommerce shops boost revenue and communicate better with their customers. You can read full details about the partnership here. Currency improvements – We’re improving the way the Jilt dashboard handles displaying sales and revenue information in multiple currencies. Product recommendations – We’re working on a new content block for the Jilt email editor allowing you to add recommended products to your emails. Josh Catone is the Director of Content at Jilt. He has held lead marketing or editorial roles at Mashable, feedly, ReadWrite, Saent, and DandyID. He is also the founder of The Fluffington Post.